Mama, I’m going to drop this and you’re going to be May-aaad. I moved my compost piles this spring from one end of the garden to another. Corn was destined for that spot in the garden: corn, being a bit of a nutrient pig, would do just fine in the old compost location. (I was right, though I didn’t plant enough corn! Just a few rows of popcorn.) The rest of the former compost zone I let run wild, seeing what would come up. SQUASH came up. 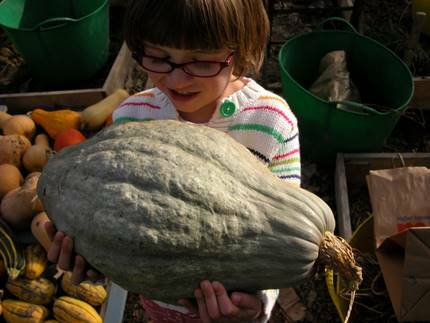 Well, this is the year that has caused me to rethink squash. Every year I am fairly successful with summer squash, but general whiz-bang success with winter squash has eluded me. I blame the annual arrival of squash bugs, some years being more frightfully plagued than others: they always manage to hit when the winter squash is blooming and fruiting. This was a plague year. Apparently, squash bugs ignore volunteer squash growing from the compost. Of the squash you see before you, I *only* planted the larger pie pumpkins in the back and the Delicata (oblong, striped) squash in the front. All the rest were volunteers from the compost pile: butternut, weird mutts, carnival squash, tiny orange kabocha. Including that Hubbard! It’s 16 pounds of fun! So, now this has me thinking. This has been such a good year for them, maybe I should actually “try” to grow them…wait, did I just jinx myself? Oh man, squash bugs totally wiped me out this year. Ugh. I’m trying to figure out a multi-pronged attack for next year. Grrrrr. Wow. I love the pictures, El. I’m trying to rethink squash too. The spousal unit is a very reluctant consumer of winter squash. I’m thinking of trying the stella blue hokkaido (reportedly fiberless and sweet) on him though, to see how he likes it. The keeping virtues of winter squash are just too profound to be ignored. Without a root cellar, or a greenhouse, and with my aversion to pickles, we don’t have many options for feeding ourselves through the winter. As for the squash bugs, after watching the hens go after them with glee, I’m half tempted to find a way to turn the girls *just* onto the squash patches of the garden and let them have at it. Must do some thinking on that front. I had no squash this year except for a few late crook necks. However, I threw a single butternut squash into the compost that didn’t get consumed last winter. The butternut squash was prolific. I also grew potatoes and tomatoes in the same pile and I’m beginning to believe I should just expand the compost bin to a spreading heap and plant everything in it. Wanna hear something dumb? I grew summer squash this summer, and I didn’t think I was supposed to plant winter squash until ::blush:: winter. I goofed. Wow, you should retire from your day job and open a produce stand. I got all my butternut this summer from the compost I dug into my new garden plot. I must have gotten 6-8 of them. I bought a buttercup last week and plan to put the seeds in the compost pile again, to see. Also, in my compost pile out back (the 3rd one), where we plan to grow the bananas, there is some squash plants coming up again. Bedevils my DH, but I love it! I can’t wait to see what it is this time! El, you’re the one who introduced me to “lasagna gardening” & it has caused me to rethink a lot about the way we grow food. My tomatoes plants were small & the tomatoes were small as well, but my volunteer tomato plants that grew on my compost heap were about four times bigger. What if growing things in that environment was akin to taking vitamins for plants? Perhaps there’s some protection given in such a perfect environment? I probably should have grown my zucchini there because the ones I grew in my “regular” beds produced practically nothing. I can’t wait until next Spring! Well, Danielle, the consensus opinion appears to be “plant them in compost.” Yeah, I seriously considered putting Reemay over the plants but pollination would be tough then. And there are hairier types of squash out there that have some natural resistance to squash bugs. I will say all my squash got attacked; there were, for example, 5 Hubbards altogether but only one got big enough to ripen before the vine died. It’s maddening. Thanks, Grammy! There’s something about the nice bright light in October on all those fall colors. Alecto, potatoes and tomatoes, check. It was the squash that really went nutso. So maybe we should just forego the compost pile and just compost in place in the beds themselves. But yes: she’s at the phase of overexaggeration of words for effect. I suppose that’ll stop at age 19. “But Mama it’s so HEAVY,” was the main cry. Brittney, Hubbards get even bigger than this normally. This one was definitely a girly-man in terms of size. Aw Angie: I remember ALL the squash you hauled in last year, it was amazing! Yeah, every year I only expect to get a few…and I never seem to have problems growing pumpkins. Hey, CC, you gotta start somewhere. Plus you’re in the Land of Plenty whereas we in the cold dark north have access to winter squash more or less all winter long. But yes, free! Morebetter! Pamela, the thought has crossed my mind. Actually, getting the kid out there selling stuff: I could certainly craft a groovy farmstand. Jules, see? How fun! Yep, I usually pluck the plants right out the compost pile and recompost them, or, often, just use the compost as a kind of nursery until I’m ready to plant them elsewhere. You never know, certainly, what’ll turn up. This year there were few mutts compared to the normal stuff so I was rather surprised. 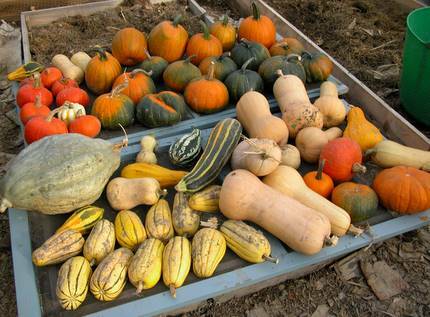 Usually you have to separate them to ensure no cross-pollination: for example, things won’t probably come true from these seeds for sure, even though there are three distinct squash families represented above (the Hubbard/kabocha, the butternut, and then the pumpkins/delicata/carnival). That is a great haul! I hear squash love rich soil, so the compost probably was heaven for them. I only got butternut squash in this year and probably got close to 100lbs of them, crazy. Wow, that’s amazing. That one squash is so huge. What a nice surprise to have so many volunteer plants. We moved our heap and the exact thing is happening! Squash bugs got us last year, but this year the plant is growing so tall, it’s running up our 8 foot fence! I think the plant is just healthier and more capable of fighting off bugs? Or maybe the soil is too acidic for the bugs? Regardless, I can’t wait to see how many volunteers we get from this. We might need to move our heap location more often!